Wedding anniversaries marks a milestone of love between two people who vowed to love each other through the good and bad, until death do us part. 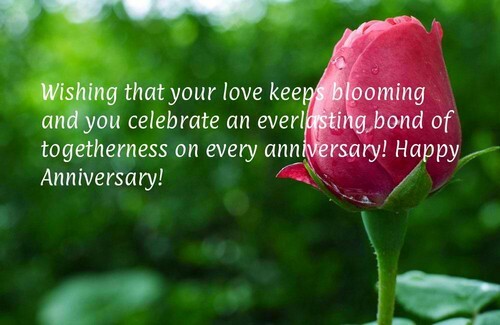 Once a year, look back at the precious memories of this sweet day with your partner. A good marriage is composed of two people who shares mutual respect, deep love and timeless friendship with each other. Here’s to more beautiful years to come. Happy anniversary! I knew that you are the one for me when falling in love with you is as easy as breathing. Best anniversary, darling. The moment I first saw you, you took my breath away. When you walked through the door with your wedding gown, my world stopped. Every morning when I wake up next to you, it still feels like having you is too good to be true. I love you! Awesome anniversary. I will spend my lifetime filling you with all the love you will ever need and more. I love you to infinity and beyond! Wonderful anniversary. Ours is a love story that knows no ending. Happy anniversary. Every year, it feels like we are newlyweds embarking into a new chapter full of beautiful possibilities. Wonderful anniversary. I’m looking forward to making more silly, sweet and lovely memories with you. Cheers to another wonderful year with you. Awesome anniversary. Since you are beside me, I have no reason to run away from the troubles that comes my way. Thank you for being my strength. 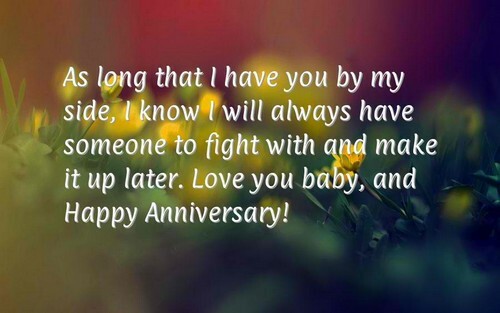 Best anniversary, honey. Growing old is not scary at all if I am counting the years with you. Best anniversary! We had our share of ups and downs, of sunshine and rain, of tears and laughter, but these only made our love for each other stronger. Awesome anniversary. I love you for the way you make me feel so loved and cared for that I do not need anything else in my life. Wonderful anniversary. When we exchanged our vows, you promised me a life of happiness, honesty and love. You did that and more – you gave me the best moments of my life. Wonderful anniversary. You are the one person in my life who I never get tired of annoying. That’s exactly the reason why I married you! Awesome anniversary, babe. You don’t mind when I look like ET sometimes or when my breath smells like fish sauce…and vice versa! Best anniversary. I married the love of my life and my best friend. Could I ask for anything better? Best anniversary. Here’s to the years of more morning coffee cups, of secretly kissing when our kids are not looking, of travelling to places we’ve never been and dinner at fancy restaurants when we have a little luxury to spare. Awesome anniversary. This is the time when we look back at our younger selves doing stupid and wonderful things together, and then look at ourselves now and wonder if we are still up for those things but just a little less stupid. Wonderful anniversary. With you, I can spend the rest of my life without pretending. Wonderful anniversary. You loved me for all my flaws. You kiss me even though I am sweaty and smelly. You still embrace all of me when I made a big mistake. Thank you, my love. Awesome anniversary. They say that marriage is a trap. I completely object on that idea when it comes to you and me. Ours is, though not a perfect journey, but a wonderful and amazing one. Best anniversary. Our marriage has its many roller coaster rides and bumpy rides. These obstacles on the road is what made our bond stronger than ever. Happy anniversary. I cannot imagine spending the rest of my life with anyone else than you. Best anniversary. Anniversaries are a celebration of our awesome years together of loaded fun and excitement. I am anticipating the beautiful things to come along our away. Awesome anniversary. The lines on our faces are the traces of the journey we had as husband and wife. Here’s to more lines and memories. Wonderful anniversary, love. Ours is not an ordinary adventure, it’s an action-packed, romantic and epic journey. Wonderful anniversary. I don’t care if I sound arrogant but I can proudly say that we are the best couple in the world. Awesome anniversary. 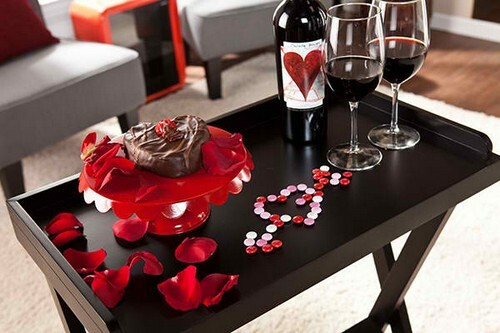 Dinner for two, movie nights, early morning cuddles – we have a lot more reason to stay together and be married forever. Happy anniversary. I have never seen a couple as happy as the two of you. 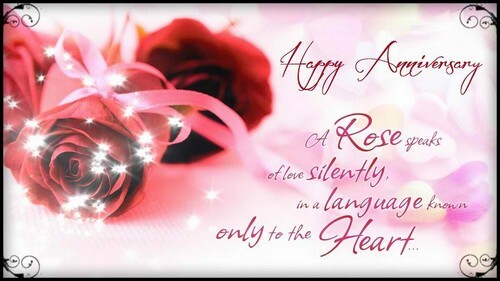 I am wishing you more wonderful and fruitful years together. Happy anniversary. When I get married, I hope that my marriage be as happy as yours. Best anniversary. The echo of your love is music that echoes in my heart and soul. I’d like to hear it on the days, years, decades and until forever. Happy anniversary. May all of your dreams as a couple take flight to the sky for many years to come. Best anniversary. Nothing in this world can compare to the brilliance of your eyes, not even the most expensive diamonds or the brightest stars in the eyes. They are the ones that guide me back home to you. Awesome anniversary. Our wedding is the biggest photo inside my heart. I will remember it as the beginning of this amazing journey. Wonderful anniversary. 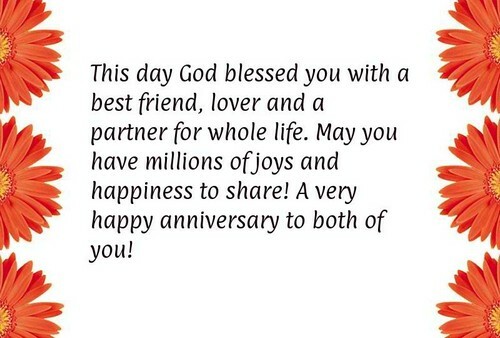 Wishing you a wonderful celebration of another milestone in your marriage and more to come. Wonderful anniversary. I am married to the best person in my life and I am looking forward to more of best times with you. Awesome anniversary. We are not a perfect couple, but we are the coolest and the craziest! Happy anniversary. If ours is a movie, I’m sure it will be the greatest romantic blockbuster movie of all time. Best anniversary. Our love is a journey of silly jokes, late night chats, date nights, laughter and moments about us. I am so proud of us, love. Happy anniversary. Being together with you is my greatest wish that came to life. Best anniversary. We crossed another year together as husband and wife. We have many hardships along the way but those only made us stronger. Happy anniversary. Success is not only measured by the money on your bank account or the position you have in your company. A happy marriage is also one of the greatest successes in life. Awesome anniversary. Your dreams , your goals and your wishes are also mine. Wonderful anniversary. We are the ultimate team. We go through the great and the worst together. We share the same quirks and craziness. Most of all, we love each other inside and out, flaws and all. Happy anniversary. Life has its way of kicking us at the back. Lucky for me, I have you to remind me that life is still beautiful as long as I have you with you. Wonderful anniversary. We are different in every way but we sync perfectly like an orchestrated masterpiece. Awesome anniversary. You stole my heart ever since the day I first met you. I don’t mind if you never give it back to me for with you, my heart will forever be safe and loved. Best anniversary. You are the rainbow road towards my dreams. You are the wings that take me to my happiness. You are the canvas where I paint my colors. Happy anniversary. Someday, I hope that the person I will marry will look at me the way you look at each other so lovingly. Best anniversary. I will never get tired of hearing how you both met and the journeys you had along the way. I am hoping to hear more in the future of the greatest love story ever. Happy anniversary. They say that marriage dulls the flame as the years go by. Not in our case! Ours burns even brighter like the stars in the sky. Awesome anniversary. With you, it’s always a combination of the most precious moments and sparks of love fizzling in every direction. Wonderful anniversary. We complement each other – you tame my demons as I love your angels. You bring sweetness to my bitter coffee and I perfect the equation with my chocolate-y love. You bring happiness during the storm and I am your shelter when your world is shaking. Happy anniversary. To years of endless friendship, eternal love and happiness that knows no end. 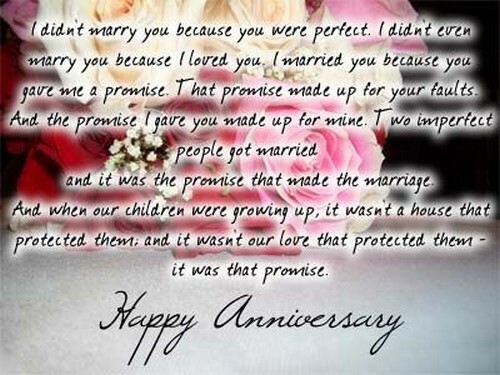 Wonderful anniversary, honey. Here’s a toast to us, for the wonderful years together filled with magic, adventure and passion. 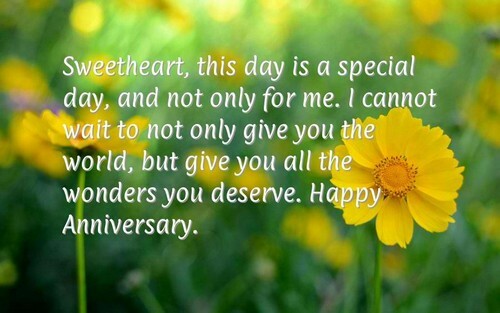 Awesome anniversary, my love. Even though I am far from perfect, you make feel like I am completely perfect. Even though I am not so easy to deal with, you make me feel like I am easy to love. Even though some blunders and hurt you in the process, you make me feel like everything is okay. Best anniversary. You are just not my better half, but you also made my life completely happy. Happy anniversary. We are the perfect cup of coffee. I am the coffee and you are the coffee and milk that balances everything out. Best anniversary. Struggles from work, mistakes from the past and the regrets I had before – all of these are sufferable as long as I have you to comfort me and grant me strength. Awesome anniversary. We are inseparable like the sky and the sun, the tree and the earth, and the rain and clouds. Happy anniversary. With you, everyday is as fantastic as a honeymoon, as exciting as a new adventure and as happy as our new trip together. Wonderful anniversary. Many will change as the years pass by – we will have wrinkles, our hair will turn grey, our kids will lead lives of their own. One thing will remain unchanged though – that’s our love and respect for each other. Wonderful anniversary. I’ve never imagined being so happy with my marriage in spite of many years passing by. I owe it to you, my best and sweetest partner in life. Awesome anniversary. Our marriage is like wine – it gets better and better with the passage of time. Best anniversary.